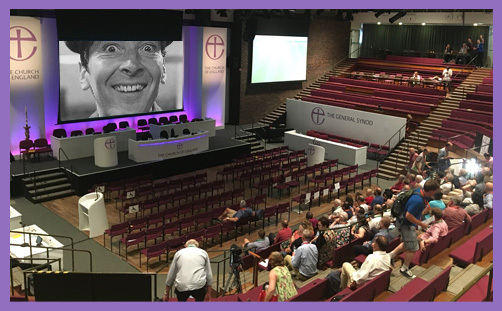 Kenneth Williams of ‘Carry On’ fame was not, alas and alack, a member of the Church of England’s General Synod. And yet his are the words for which I find myself reaching at least twice a year when the tri-cameral circus of Synod rolls into town (or two towns, to be exact: gone are the days of synods convening in exotic locations like Hertford, Hatfield, and Whitby; today, partly due to its capacity for unwieldy proliferation, Synod has swapped court and cloister for an administrative centre in London and a university in York). The business of Synod itself seems to have only two settings – inexorable procedural tedium, or full-on, faeces-meets-fan bust ups. The latter are rare but are still of sufficient interest to news organisations for them to send poor, beleaguered journalists along, just in case one might occur. If you really want to know about the Babylonian captivity that is an afternoon session at General Synod, ask these latter-day exiles. There was no real drama at the most recent session in York (6th-10th July). However, Synod did manage to excel itself in the navel-gazing stakes, making the inhabitants of ‘Love Island’, or those recently so marvellously rescued from the Thai cave network, look positively in touch with the outside world by comparison. On Monday 9th July, Synod noted that it did not have time to discuss evangelism. I must confess to having few clerical heroes: one such is Henry Phillpotts, dogged and doughty Bishop of Exeter for nearly half the nineteenth century. He was not everyone’s cup of tea – Sydney Smith said of him: “I must believe in the Apostolic succession, there being no other way of accounting for the descent of the Bishop of Exeter from Judas Iscariot.” When not being prickly, Phillpotts’ great project was the restoration of Convocation, or Synod as it was to become. His vision was of a gathering that might give “means of counsel and aid to the Bishops”. On Monday, one Bishop tweeted that the failure of Synod to even give one minute to evangelism left him “appalled but not surprised”. Of course excuses abounded, but, while we can all appreciate the importance of the nitty-gritty, to say that Synod’s constant insistence on either technical minutiae or tearing itself apart over whichever argument it’s decided to have this year is itself missional, is deluding ourselves. If discussing technicalities is mission, why are people not flocking to join parochial church councils? If there are those who think where we are at the moment in terms of our evangelistic endeavours is good enough then that’s their prerogative – but I would suggest that even a cursory look at attendance rates and wider engagement paints a different picture, and not one to which the response is to describe procedural legislation as ‘mission’. There are issues of both essence and accidence: Phillpotts may not have envisaged the Sadducean squabbling we see biannually today, but, as the current make up of Synod’s brasher big brother the House of Commons shows, elected representatives almost never live up to the expectations of either their constituents or the constitution. Yet the make-up of Synod is a problem too. If a system devoid of government is an anarchy, the Church of England operates under an anorak-y. This is an institution that educates millions, feeds thousands, visits, sustains, and cares for many hundreds of thousands more all across the country, diverse in age, race, politics, and class. Yet the governance of this institution is in the hands of those who would willingly (some joyfully) spend the sunniest weekend of the year in a poorly-ventilated conference hall talking about the remuneration of residentiary canons. Is it any wonder the CofE is considered out of touch? The combination of procedural pettiness and the prioritisation of personal pet projects by members means that explicit Christian evangelism – the basic task of the Church on earth – is bumped off the agenda in favour of the discussion of detail by a cadre of initiates. Synodical governance for the Church of England is the equivalent of putting the management of the British rail network into the hands of the UK Trainspotters’ Forum. The Rev’d Marcus Walker has suggested a system of general election, leading no doubt to a more developed party system. It’s a novel idea, and has the potential to be incredibly amusing if nothing else, but it’s hardly likely to re-entrench a streamlined, bi-partisan focus on the propagation of the all-consuming, all-levelling love of Christ Jesus. So what is the bloody point? Well, if the redemptive love of Christ, shown forth bloodily and bodily, is not the explicit point, the centre, the crux of what we do, then it is hard to see a continued future existence for the Church of England. Bringing knowledge of that love to God’s people should be at the top, in bold, of every agenda; not squeezed out after procedural wrangling is complete (even if it has been labelled as ‘mission’). Evangelism has many forms: it is done by both liberals and conservatives, by Catholics and Evangelicals; it is sometimes done well and sometimes done badly. Our Bishops are here to resource it being done better, so more people can know and love Jesus Christ. They often do so admirably, but if Synod doesn’t want to help them, then what’s the bloody point?